"By Snow Kiters for Snow Kiters." The Heart and Soul of the North Country Snow kite Community. 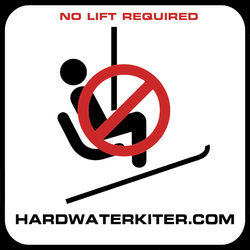 Hardwater Kiting is the only dedicated snow specific kite school and kite retailer in the Northeast. We're mostly die hard skiers and snowboarders who have found snow kiting to be the best way to get the most out of our snow riding season that eliminates wasting the limited time we have on this earth. Wasting time waiting. Waiting in traffic to get to the hill, waiting in ticket lines, waiting in lift lines. Waiting on the chair ride up. Snow kiting frees us of that and lets us focus on what's really important. Our mission is to share the snow kiting stoke with like minded, adventurous lovers of winter. We're experts in winter riding with unmatched snow kite experience on the frozen lakes of New England. Our focus is kiting on New England snow and ice and nobody does it better. Our clients don't come to us to simply learn to snow kite. They come to learn to snow kite like us. retail sales of the best snow kites from Ozone, HQ and Flysurfer and all the support gear you need to be safe, self sufficient and, well, AWESOME. We're the one stop New England snow kite source. Snow kiting is our passion, our livelihood and our business. For us its not a hobby or side gig to get cheap gear. Its what puts food on the table, keeps the heat on and drives us to share our 14 years of in depth, snow kite specific experience with our clients and customers to afford them the best gear and best winter kiting experience possible . 1) More than a decade of intense, pure, dedicated New England lake based kite skiing experience. Our experience paired with tireless research gives us the experience needed to know what lakes work best in a given wind condition and how to avoid potentially dangerous areas to offer our clients a safe and fun session in some pretty amazing places around New England. 2) We have one of only four IKO trained snow kite instructors in the country. 3) We use a well researched and monitored network of 40 launch sites within 40 minutes of our home base here in beautiful North Conway NH in addition to the support of a small network of observers that we rely on to give us updates on lake conditions that we cannot easily check ourselves. . A huge part of our workload is inspecting and assessing the ice and surface conditions on the lakes we ride. 4) 20 years of New England ski shop technical experience and even more years of skiing Northern New England back-country, mostly in and around the Mount Washington/White Mountains Region. This experience translates well to kite skiing and gives us the expertise that serves our customers well when it comes to selecting the best gear combinations for a wide range of snow-kite conditions. Having the best kite doesn't help if what you have on your feet isn't right. 5) In addition to providing professional certified kite skiing instruction, Hardwater Kiting also supplies some of the best equipment for any snow kite adventure. As the largest authorized Northern New England dealer of great snow-kite brands Ozone, Flysurfer, HQ , so in addition to lessons we also offer a full range of kite options. Our gear offerings are based on first hand experience. WE ACTUALLY USE WHAT WE SELL. And we offer demos for those who want to try before they buy. 6) Experience. Experience that we count not only in years but in mileage as well with literally tens of thousands of miles of riding under our belts. All of which on various types and makes of ram air foils. ​In a world where other's are just discovering the benefits of foil kites, we are some of the most experienced foil fliers on the planet and experts in using depower foil kites. We have a 15 year head start! When it comes to learning, choosing and purchasing foils we feel our experience is a huge asset to kiters looking to buy the right foil for their needs. Sometimes hard earned snow kite experience, teaching us what works best for kite skiing and kite snowboarding here in the New England. Hardwater Kiting is proudly supported by a snow kite community of local riders, "long distance" locals, students and clients. ​We strive to return that support and give back to those who love snow kiting as much as we do.